If you have more than one pet, you'll know about the fights that can occur over the feeding bowls. Cats eat other cats' food, dogs eat everything, and babies even have a go too. If only there was a way to ensure that each animal got exactly what they should, without feeding them at different times of the day. There is, and the chances are your cat is already compatible. 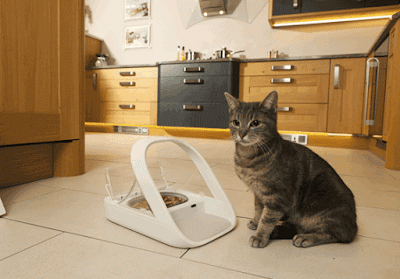 We test the SureFeed Microchip Pet Feeder. However, what happens if your cat isn't microchipped? Well, the SureFeed Microchip Pet Feeder comes with a collar tag that works just the same way as the sub-dermal chips, and allows you to programme the feeder in the same way, too. 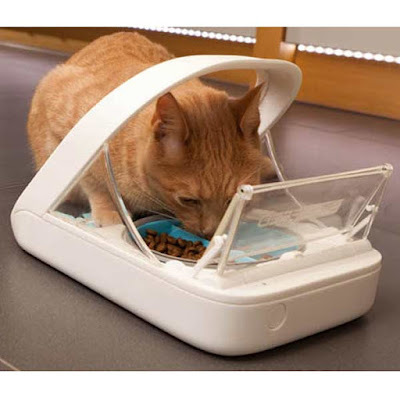 It is a simple case of setting the feeder into pairing mode with a button on the back, then encouraging your cat to approach and have a snack. It reads the cat's ID chip and then will only only when that chip is detected in the future. And it works really well, with the lid flipping open when the cat pokes his head through the scanner ring. Obviously this is good news for the cat, and not just because it stops other pets from pinching his dinner. Having a lid over the food constantly will also help to prolong it's freshness, so it should stay tastier for longer. Double cat win! This is also pretty important if your cat is currently on medication, as it ensures that only the intended puss gets the meds. 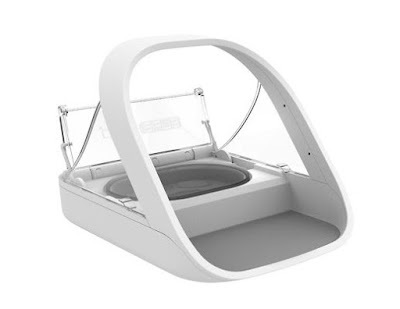 Also, the bowl and mat can be removed to wash, or to be swapped out and replaced by another colour, for a change or to differentiate in case you have more than one feeder. We've really enjoyed having it in Test Pit Towers, and the cat has surely benefited. It took him a little bit of time to get used to it, especially as he has to put his head through the loop to get to the bowl. However, after a couple a days he seemed very happy to do so, and even relished watching the lid flip open at his presence. Like a damn Jedi cat!